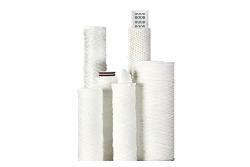 String-wound filter cartridges are offered in a multitude of materials and efficiencies to provide economic filtration solutions, while optimizing fluid compatibility and process requirements. By thermally bonding all polypropylene materials to create a filtration matrix, Behringer melt-blown filter cartridges are an economical solution for high quality filtration, while using all polypropylene materials that meet FDA regulation 21CRF177.1520. Resin Bonded filter cartridges are manufactured using phenolic resin-impregnated media made from extra-long acrylic and polyester fibers. They are an economical and disposable element. No silicone is used in the manufacturing process. High performance elements for nearly all fluids. Degree of filtration 2 µm up to 500 µm. Nominal size 5 up to 1800 Differential pressure resistant up to 210 bar (3045 psi). Behringer cartridges are an economical way to offer superior filtration for process applications. Manufactured from industrial-grade unbleached natural cotton material, these inexpensive cartridges are an excellent match for a variety of industrial fluids, as well as organic solvents and edible oils.